Taras Baginets was born in in 1975. 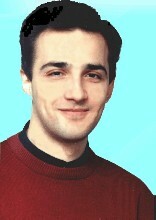 In 1997 he graduated Kharkiv Conservatory (Prof. S.Jushkevych - piano). He studed organ in master-classes under the leadership of Prof.H.Walter, (Germany), Prof. M.Radulesku (Austria) & H.Fagius (Sweden). Since 1995 he presents organ recitals in Ukraine, Russia, Danmark, Germany, Sweden, France, Italy, Chech Republik etc. Taras Baginets was participate at the numerous Festivals in Ukraine & Europa. He founded & provide cycles of organ recitals (Organ History, J.S. Bach) in Kharkov Concert Hall of Organ and Chamber Music, regularly appear with numerous musicians and ensembles. Records on CD, radio, TV. Special Prize at the V-th International Organ Competition (Odense, Danmark).